Turkey recalls its ambassadors from Israel and the United States in protest over Gaza riots. Erdogan blasts Israel as a "terror state". Turkey on Monday recalled its ambassadors from Israel and the United States in protest over the deadly riots along the border between Israel and Gaza. Deputy Turkish Prime Minister Bekir Bozdag told reporters in Ankara that Turkey was recalling the two ambassadors "for consultations", reported the AFP news agency. Bozdag also said Turkey was calling an emergency meeting of the Organization of Islamic Cooperation (OIC) on Friday, but did not give details over its format. 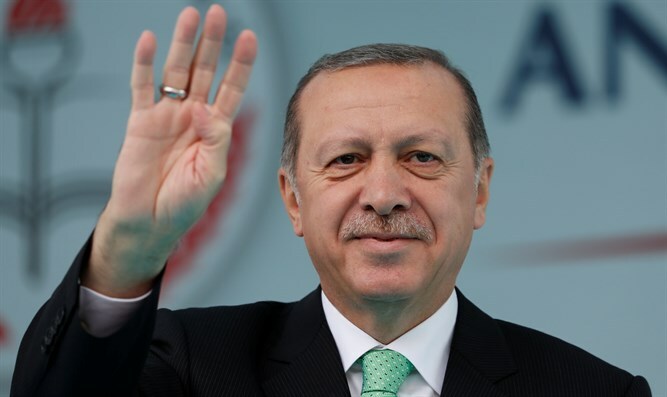 Meanwhile, Turkish President Recep Tayyip Erdogan accused Israel of "state terror" and "genocide" after at least 55 Palestinian Arabs were killed in the clashes on the Gaza border. In one of his most vehement broadsides ever against the Jewish state, Erdogan also announced three days of national mourning over the deaths, as well as a giant protest in Istanbul on Friday. "Israel is wreaking state terror. Israel is a terror state," Erdogan told Turkish students in London, according to AFP. The Hamas terrorist organization led violent and mass terrorist acts throughout the day on Monday, in protest against the inauguration of the new United States embassy in Jerusalem. 79 Gaza rioters have reportedly been killed since the beginning of the riots, dubbed the “March of Return”, on March 30. The mass-demonstrations kicked off six weeks of violent clashes along the Israel-Gaza border, culminating in a massive “Nakba Day”, on which Arabs mark what they view as the “disaster” of Israel’s establishment. Earlier on Monday, Erdogan said that the U.S. has lost its role as mediator in the Middle East by moving its embassy in Israel to Jerusalem. Erdogan called the U.S. embassy move from Tel Aviv to the city of Jerusalem "very, very unfortunate," claiming it "will increase tensions and ignite an even greater fire between communities." Last month, Erdogan accused Israel of being a “terrorist state”, and called Prime Minister Binyamin Netanyahu a “terrorist”, after IDF forces opened fire on infiltrators during a Hamas-led confrontation on the Israel-Gaza border. Last year, Erdogan described Israel as a "terrorist state" that kills children, to which Prime Minister Binyamin Netanyahu responded, "I am not used to receiving lectures about morality from a leader who bombs Kurdish villagers in his native Turkey, who jails journalists, who helps Iran go around international sanctions, and who helps terrorists, including in Gaza, kill innocent people."